The world’s largest economies seem engaged in something like the children’s game of “musical chairs.” For years, the United States has been the world’s largest national economy, though in recent decades the integrated economy of the European Union has challenged that claim given that the region includes four of the ten top national economies, Germany, the United Kingdom, France and Italy. The most recent data, reflecting the deep European recession, indicates that the top position has been retaken by the United States. The International Monetary Fund (IMF) has released its semi-annual World Economic Outlook Database for October 2013. Information is provided for 189 country-level geographies, from 1980 to the present, with projections to 2018. 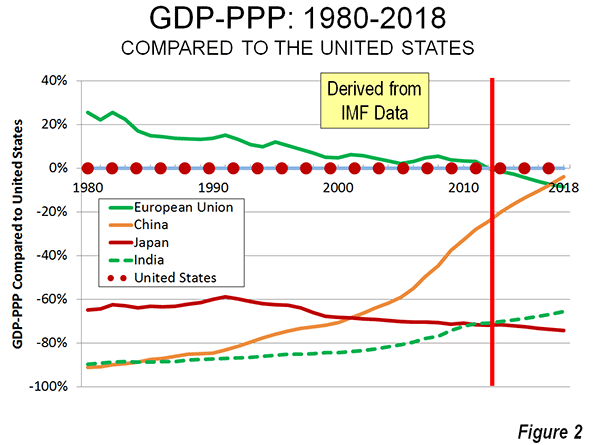 Despite the economic malaise, the IMF data shows the US gross domestic product, adjusted for purchasing power parity (GDP-PPP), to be greater than that of the combined 28 member European Union (EU). This development, however, is at least partially due to accounting revisions, which are described below. The new data shows the United States to have a 2012 GDP-PPP of $16.245 trillion (current international dollars), two percent above the EU’s $15.933. This difference is relatively minor – the equivalent of Maryland’s GDP. In 2011, the EU led the US by a small margin, before the accounting methodology change. The IMF expects the US lead to be lengthened to approximately 10 percent by 2018. For comparison, in 1980, the same 28 EU economies had a GDP nearly one-quarter larger than that of the United States (Figures 1 and 2). However, it must be noted that in 1980, the European Union had only nine members and had an economy 8 percent smaller than that of the US. China’s reduced, but still strong economic growth has propelled it to a GDP-PPP of $12.3 trillion, reaching 75 percent of the US figure. By 2018, the IMF expects China to reach 96 percent of the US GDP. If the IMF projected GDP increase rates of China and the US were to continue, China would be a larger economy than the United States by 2020. While this may be seem to be occurring sooner than expected, it is consistent with the expectation of former IMF economist Arvind Subramanian, in his book Eclipse: Living in the Shadow of China’s Economic Dominance. The scale of Chinese economic miracle that started under Deng Xiaoping can be seen by the fact that in 1980 its GDP was barely 10 percent of the US economy (See Ronald Coase and Ning Wang, How China Became Capitalist). India’s economy also continues to progress. Now the world’s fifth largest economy, India’s GDP-PPP is estimated at $4.7 trillion. By 2012, India’s economy had reached 29 percent of that of the United States, nearly triple the 1980 figure. IMF expects India to close the gap by another five percentage points by 2018. Japan has fallen to the fifth largest economy, at approximately $4.58 trillion. Japan had grown strongly after World War II, having reached 35 percent of the US economy by 1980. A number of experts, such as Harvard’s Ezra Vogel, expected that Japan would continue to close the gap with the United States. But Japan’s ascendency stopped by 1991, when it reached a size 41 percent of the US economy. In the subsequent economic slide, Japan’s economy fell to 28 percent of the US by 2012. IMF expects another two point drop by 2018. The United States remains dominant in personal affluence among the world’s largest economies. In 2012, the US GDP-PPP per capita was $51,700. 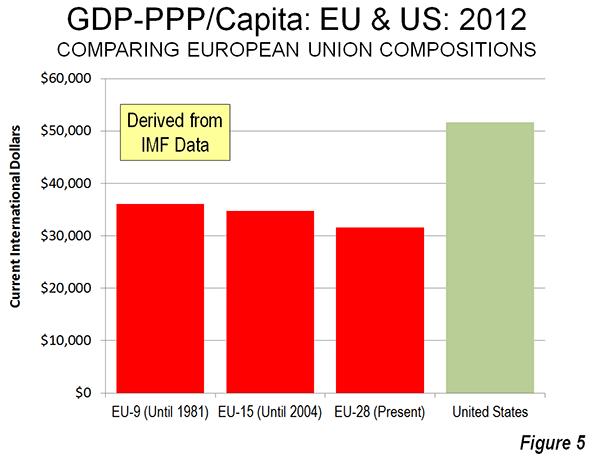 The European Union had a GDP-PPP of $31,600 in 2012, but is declining relative to the United States. In 2012, the EU GDP per capita was 61 percent of the US figure. This is down from a peak of 66 percent in 1982. IMF projects a further three percentage point loss by 2018 (Figures 3 and 4). The GDP-PPP per capita of the nations in the 9 nation European Union of 1980 was higher, at $36,100 in 2012 (Figure 5). 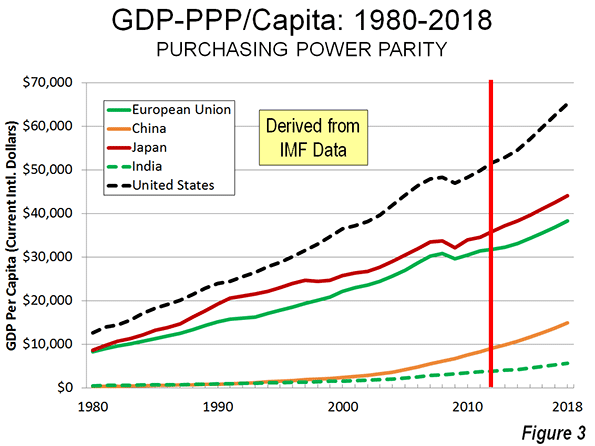 Despite China’s potential for becoming the world’s leading economy by the beginning of the next decade, its huge population makes the GDP per capita much lower. In 2012 China’s GDP per capita was $9,100, about 18 percent of the US figure. This is, however, far higher than the 1980 figure of 2 percent. IMF expects China’s GDP per capita to rise to $14,900 by 2018, 23 percent of the US figure. India’s GDP per capita was $3,800 in 2012, or seven percent of the US GDP per capita. India’s progress has been rapid, though strongly overshadowed by China. India’s GDP per capita was 70 percent higher than China’s in 1980, but now China’s is now 60 percent higher. However, India has gained five percentage points on the US since 1980. 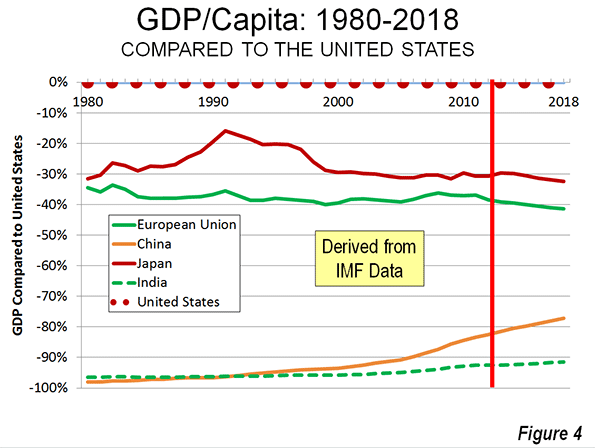 Japan’s GDP per capita stood at 69 percent of the US figure in 2012 ($35,900), down significantly from 1991, when Japan’s GDP per capita reached 84 percent of the US level. IMF projects about a 1.5 percentage point further decline by 2018. The US Department of Commerce, Bureau of Economic Analysis indicates that Europe will convert to the new methodology in 2013 and it is to be expected that other nations will quickly follow. 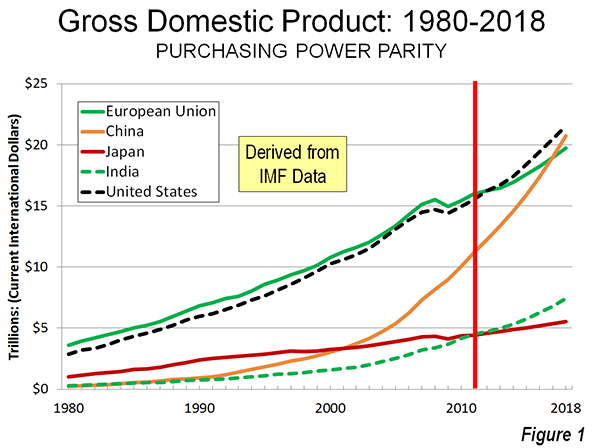 Before the accounting revision IMF data predicted that US would not pass the EU until 2015. Further, the previously lower GDP figures predicted that China would pass the United States just two years later (2017). China may have to wait to assume the top chair, but perhaps not. It all depends on how fast China converts to the new accounting and the impact of the revision on GDP figures. Of course, economic projections cannot be “taken to the bank.” The world economy is volatile and uncertain and more so now that in more stable times. The US economy continues to sputter along with lagging growth. The European economy is doing even more poorly. Mixed signals continue to be heard from China, where astronomic growth rates are being replaced, at least for the moment, by more modest ones. President Xi Jinping says that China can create sufficient employment for its growing urban workforce with a 7.2 percent growth rate (See: “China Needs 7.2% Growth to Ensure Employment” in The Wall Street Journal) – a rate that would be the envy of each of the world’s strongest economies. The big high income world nations also have reason to envy India. According to the Organization for Economic Cooperation and Development (OECD), the economy of India “clocked a low growth rate of 4.4 percent” in the April to June quarter. The OECD characterized India’s immediate economic prospects as “weak,” yet India’s growth rate is far above those of the US, EU and Japan. The Bank of Japan (BOJ), the nation’s reserve bank, is optimistic about the nation’s new growth-seeking policies under “Abenomics” (named after Prime Minister Shinzo Abe). But the BOJ predictions of economic growth at 1.5 percent in 2014 and 2015 are favorable only in the light of Japan’s anemic recent growth. Submitted by katiechavez on Mon, 11/25/2013 - 05:53. There's always been a stiff competition between US and EU, but US always gain momentum though EU contains 28 member countries. But, scenario is going to change in next 10 years, with China and India growing rapidly, in terms of economy and infrastructure.